If the Internet international archives will register 2013 as the year of Edward Snowden and the disclosure of National Security Agency (NSA) surveillance programs by the media, 2012 was all about the mobilization against a United Nations (U.N.) attempt to take over the Internet. 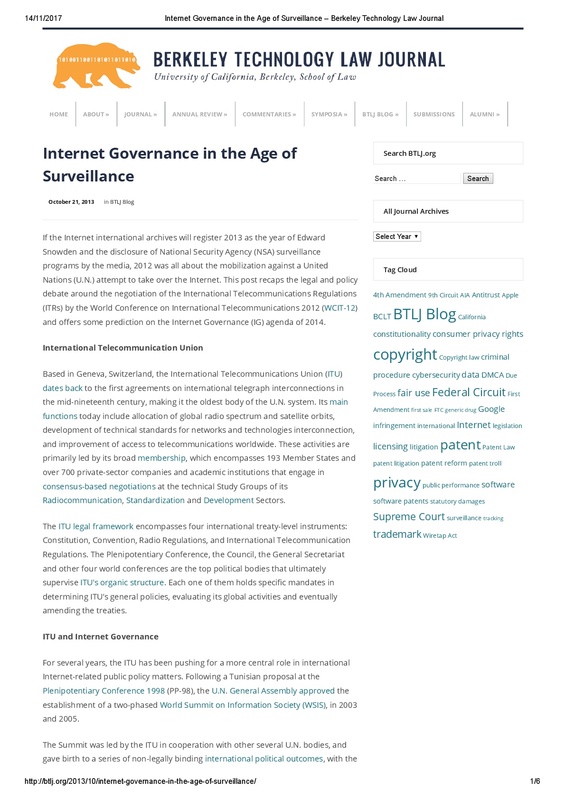 This post recaps the legal and policy debate around the negotiation of the International Telecommunications Regulations (ITRs) by the World Conference on International Telecommunications 2012 (WCIT-12) and offers some prediction on the Internet Governance (IG) agenda of 2014. ALVES JÚNIOR, Sérgio, “Internet Governance in the Age of Surveillance,” Curadoria Enap, acesso em 22 de abril de 2019, https://exposicao.enap.gov.br/items/show/274.